In ’70s New Jersey, the car was a powerful image. That summer, I bought my first set of wheels for two thousand dollars. It was a ’57 Chevy with dual four-barrel carbs, a hurst on the floor, and orange flames spread across the hood. It’s where I lived my songs, and wrote my songs. I drove all night on those back streets, celebrated Independence Day, and saw wrecks on the highway—that turnpike sure is spooky at night when you’re all alone. I even ate fried chicken in the front seat with my best girl sitting in my lap, wiping our fingers on a Texaco roadmap. The car was part of me and, you know, I was part of the car. You never forget your first love or your first set of wheels, ain’t that right Steve? And now, well now I’m putting that car up for auction. I’ve been keeping it in the best garage around—the Rock ‘n’ Roll Hall Of Fame In Cleveland, Ohio—since 2010. (Pauses for cheers) You know, they say that was part of the largest Bruce Springsteen exhibit ever. And now, a lucky fan with lots of dough is gonna have it all to themselves. Of course, she’s in perfect working order. You gotta take care of your car, just like you’d take care of your best girl. No, we’re not gonna do that one. Not tonight. The electrical and mechanical systems have been overhauled, but the body, it hasn’t been touched since I owned it. I’m even gonna throw in the original registration, temporary insurance card, and Allstate insurance card issued in my name and address. 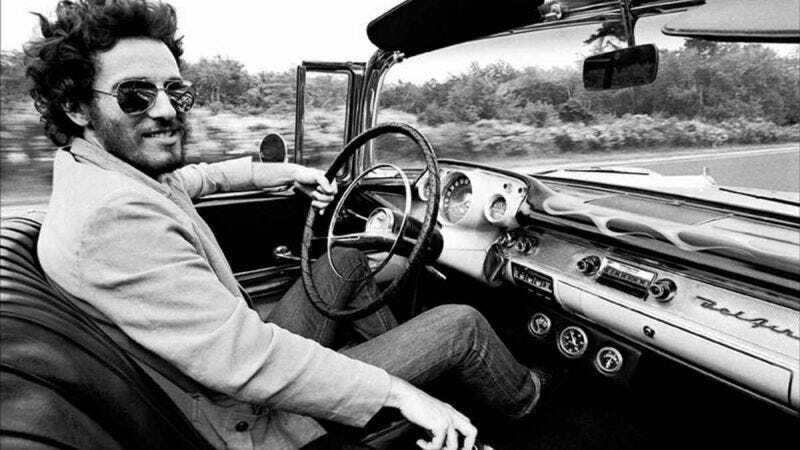 I’m also going to include Out In The Street: Bruce Springsteen’s 1957 Chevrolet Bel Air Convertible, a detailed color book by my friend and noted Springsteen historian Michael Crane. He’s a good guy, a good guy. “Oh, yeah,” The Boss replies. There are currently five days left on the auction, with a current high bid of $100,400.